The two sources of sound, S1 and S2, emitting waves of equal wavelength 20.0 cm, are placed with a separation of 20.0 cm between them. A detector can be moved on a line parallel to S1 S2 and at a distance of 20.0 cm from it. Initially, the detector is equidistant from the two sources. Assuming that the waves emitted by the sources are in detector should be shifted to detect a minimum of sound. On solving, we get, x = 12.6 cm. Hence, the detector should be shifted by a distance of 12.6 cm. Two sources of sound S1 and S2 vibrate at same frequency and are in phase. The intensity of sound detected at a point P as shown in the figure is I0. (a) If θ equals 45°, what will be the intensity of sound detected at this point if one of the sources is switched off? (b) What will be the answer of the previous part if θ = 60°? The two sources of sound S1 and S2 vibrate with the same frequency and are in the same phase. I04when the source is switched off. Two successive resonance frequencies in an open organ pipe are 1944 Hz and 2592 Hz. Find the length of the tube. The speed of sound in air is 324 ms−1. Let l be the length of the resonating column. (n+2)v4l-nv4I=2592-1944=648⇒2v4l=648⇒l=2×324×1004×648cm=25 cmHence, the length of the tube is 25 cm. A Kundt’s tube apparatus has a steel rod of length 1.0 m clamped at the centre. It is vibrated in its fundamental mode at a frequency of 2600 Hz. The lycopodium powder dispersed in the tube collects into heaps separated by 6.5 cm. Calculate the speed of sound in steel and in air. A bat emitting an ultrasonic wave of frequency 4.5 × 104 Hz flies at a speed of 6 m s−1 between two parallel walls. Find the fractional heard by the bat and the beat frequencies heard by the bat and the beat frequency between the two. The speed of sound is 330 m s−1. Let us assume that the bat is flying between the walls X and Y. Two electric trains run at the same speed of 72 km h−1 along the same track and in the same direction with separation of 2.4 km between them. The two trains simultaneously sound brief whistles. A person is situated at a perpendicular distance of 500 m from the track and is equidistant from the two trains at the instant of the whistling. If both the whistles were at 500 Hz and the speed of sound in air is 340 m s−1, find the frequencies heard by the person. θ=tan-10.52.4/2=22.62°The velocity of the source will be ‘v cos θ’ when heard by the observer. A traffic policeman sounds a whistle to stop a car-driver approaching towards him. The car-driver does not stop and takes the plea in court that because of the Doppler shift, the frequency of the whistle reaching him might have gone beyond the audible limit of 25 kHz and he did not hear it. Experiments showed that the whistle emits a sound with frequency closed to 16 kHz. Assuming that the claim of the driver is true, how fast was he driving the car? Take the speed of sound in air to be 330 m s−1. Is this speed practical with today’s technology? v0be the velocity of the observer. 20×103=330+v0330-0×16×103⇒ 330+v0=20×33016⇒ v0=20×330-16×3304 =3304m/s=297 km/h(b) This speed is not practically attainable for ordinary cars. A small source of sound S of frequency 500 Hz is attached to the end of a light string and is whirled in a vertical circle of radius 1.6 m. The string just remains tight when the source is at the highest point. (a) An observer is located in the same vertical plane at a large distance and at the same height as the centre of the circle. The speed of sound in air = 330 m s−1 and g = 10 m s−2. Find the maximum frequency heard by the observer. (b) An observer is situated at a large distance vertically above the centre of the circle. Find the frequency heard by the observer corresponding to the sound emitted by the source when it is at the same height as the centre. Frequency of sound heard by the observer v, = ? fA=vv+vs×n0 =300300+4×500=494 HzTherefore, maximum frequency heard by the observer is 514 Hz. If you are walking on the moon, can you hear the sound of stones cracking behind you? Can you hear the sound of your own footsteps? No, we cannot hear the sound of stones. Sound is a mechanical wave and requires a medium to travel; there is no medium on the moon. No, we cannot hear the sound of our own footsteps because the vibrations of sound waves from the footsteps must travel through our body to reach our ears. By that time however, the sound waves diminish in magnitude. Can you hear your own words if you are standing in a perfect vacuum? Can you hear your friend in the same conditions? Yes, we can hear ourselves speak. The ear membrane, being a part of our body, vibrates and allows sound to travel through our body. No, we cannot hear our friend speak as there is no medium (air) through which sound can travel. A vertical rod is hit at one end. What kind of wave propagates in the rod if (a) the hit is made vertically (b) the hit is made horizontally? A longitudinal wave propagates when the rod is hit vertically. When hit horizontally too, a longitudinal wave is produced (sound wave). However, if the rod vibrates, the wave so developed is transverse in nature. Two loudspeakers are arranged facing each other at some distance. Will a person standing behind one of the loudspeakers clearly hear the sound of the other loudspeaker or the clarity will be seriously damaged because of the ‘collision’ of the two sounds in between? It depends on the position of the speakers. The placement decides whether the interference so formed is constructive or destructive. The voice of a person, who has inhaled helium, has a remarkably high pitch. Explain on the basis of resonant vibration of vocal cord filled with air and with helium. The frequency of sound produced by vibration of vocal chords is amplified by resonance in the voice box. Now resonant frequency is directly proportional to the velocity of sound present in the voice box. Now as Helium has less density than air, velocity of sound in Helium is higher than that in air. Higher velocity of sound in Helium implies that the resonant frequency of the sound in voice chamber filled with Helium will be higher than with air. Thus the voice is high pitched in Helium filled voice box. Draw a diagram to show the standing pressure wave and standing displacement wave for the 3rd overtone mode of vibration of an open organ pipe. The displacement node is a pressure anti-node and via-versa. Two tuning forks vibrate with the same amplitude but the frequency of the first is double the frequency of the second. Which fork produces more intense sound in air? We know that: intensity ∝ (amplitude)2. However, the intensity is independent of frequency. As the amplitude of the vibrating forks is the same, both the forks produce sounds of the same intensity in the air. In discussing Doppler effect, we use the word “apparent frequency”. Does it mean that the frequency of the sound is still that of the source and it is some physiological phenomenon in the listener’s ear that gives rise to Doppler effect? Think for the observer approaching the source and for the source approaching the observer. The frequency of the sound is still that of the source. However, the frequency of the vibrations received by the observer changes due to relative motion. If both (the observer and the source) move towards each other, then the frequency of the vibrations received by the observer will be higher compared to the original frequency. Consider the following statements about sound passing through a gas. (A) The pressure of the gas at a point oscillates in time. (B) The position of a small layer of the gas oscillates in time. (a) Both A and B are correct. (b) A is correct but B is wrong. (c) B is correct but A is wrong. (d) Both A and B are wrong. Sound is a longitudinal wave produced by the oscillation of pressure at a point, thus, forming compressions and rarefactions. That portion of gas itself does not move but the pressure variation causes a disturbance. Here p denotes the change in pressure from the equilibrium value. When we clap, there is a change in pressure, which sets a disturbance and forms a wave. However, this variation is not uniform every time we clap (unlike in the case of a sound wave). Hence, we sum up all the disturbances. (d) cannot be compared with its value in water. For proper comparison, we need numerical values. A tuning fork sends sound waves in air. If the temperature of the air increases, which of the following parameters will change? v∝TAs the temperature increases, the speed also increases. However, since the frequency remains the same, its wavelength changes. When sound wave is refracted from air to water, which of the following will remain unchanged? When a sound or light wave undergoes refraction, its frequency remains constant because there is no change in its phase. (d) neither the elastic property nor the inertia property. Propagation of any wave through a medium depends on whether it is elastic and possesses inertia. A wave needs to oscillate (elastic property) for it to be propagated and if it does not have inertia, the oscillations won’t keep on moving to and fro about the mean position. (d) the energy is redistributed and the distribution remains constant in time. The energy is redistributed due to the presence of interference. However, as the frequency and phase remain constant , the distribution also remains constant with time. A steel tube of length 1.00 m is struck at one end. A person with his ear closed to the other end hears the sound of the blow twice, one travelling through the body of the tube and the other through the air in the tube. Find the time gap between the two hearings. Use the table in the text for speeds of sound in various substances. t2=15200Where, t1 is the time taken by the sound in air. t2 is the time taken by the sound in steel tube. Required time gap t=t1-t2⇒t=1330-15200⇒t= 2.75×10-3 s⇒t= 2.75 msHence, the time gap between two hearings is 2.75 ms.
(d) at distances L/8 inside the ends. For an open organ pipe in fundamental mode, an anti-node is formed at the middle, where the amplitude of the wave is maximum. Hence, the pressure variation is also maximum at the middle. An open organ pipe has sound waves that are longitudinal. These waves undergo repeated reflections till resonance to form standing waves. (d) for sound waves only. When two or more waves of slightly different frequencies (v1 – v2 â‰¯ 10) travel with the same speed in the same direction, they superimpose to give beats. Thus, the waves may be longitudinal or transverse. The frequency of the sonometer may be 512 ± 6Hz, i.e., 506 Hz or 518 Hz. On increasing the tension in a sonometer wire, the velocity of the wave (v) increases proportionately as the number of beats decreases. Therefore, the frequency of the sonometer wire is 506 Hz. =vFor the Doppler effect to occur, there must be relative motion between the source and the observer. However, this is not the case here. Hence, the frequency heard by the passenger is υ. (d) separation between the source and the observer. v0=v±u0v±usvsIt is clear from the equation that the change in frequency due to Doppler effect depends only on the relative motion and not on the distance between the source and the observer. v1, v2, v3be the frequencies heard when the source is at A, B and C respectively. At B, the velocity of the source is along the line joining the source and the observer. Therefore, at B, the source is approaching with the highest velocity as compared to A and C. Hence, the frequency heard is maximum when the source is at B. When you speak to your friend, which of the following parameters have a unique value in the sound produced? The frequency, wavelength and amplitude do not have a unique value in the sound produced. The frequency (and wavelength) changes as the pitch of the sound varies, while the amplitude is different as the loudness varies. However, the speed of sound in the air at a particular temperature is constant, i.e., it has a unique value. The fundamental frequency of a vibrating organ pipe is 200 Hz. (a) The first overtone is 400 Hz. (b) The first overtone may be 400 Hz. (c) The first overtone may be 600 Hz. (d) 600 Hz is an overtone. ν1=200 Hz, ν2=400 Hz, ν3=600 HzIf the pipe is an open organ pipe, then the 1st overtone is 400 Hz. Option (b) is correct. Also, υ3 = 600 Hz, i.e., second overtone = 600 Hz. 600 Hz is an overtone. Therefore, option (d) is correct. Therefore, option (c) is also correct. A source of sound moves towards an observer. (a) The frequency of the source is increased. (b) The velocity of sound in the medium is increased. (c) The wavelength of sound in the medium towards the observer is decreased. (d) The amplitude of vibration of the particles is increased. (c) The wavelength of the sound in the medium towards the observer decreases. Due to Doppler effect, the frequency or wavelength of the sound changes towards the observer only. The actual frequency and wavelength of the source does not change. A listener is at rest with respect to the source of sound. A wind starts blowing along the line joining the source and the observer. Which of the following quantities do not change? The frequency does not change. Hence, the time period (inverse of frequency) also remains the same. At a prayer meeting, the disciples sing JAI-RAM JAI-RAM. The sound amplified by a loudspeaker comes back after reflection from a building at a distance of 80 m from the meeting. What maximum time interval can be kept between one JAI-RAM and the next JAI-RAM so that the echo does not disturb a listener sitting in the meeting. Speed of sound in air is 320 m s−1. The distance of the building from the meeting is 80 m.
∴ t=sv=160320=0.5 sTherefore, the maximum time interval will be 0.5 seconds. A man stands before a large wall at a distance of 50.0 m and claps his hands at regular intervals. Initially, the interval is large. He gradually reduces the interval and fixes it at a value when the echo of a clap merges every 3 seconds, find the velocity of sound in air. â€‹He has to clap 10 times in 3 seconds. Hence, the velocity of sound in air is 333 m/s. A person can hear sound waves in the frequency range 20 Hz to 20 kHz. Find the minimum and the maximum wavelengths of sound that is audible to the person. The speed of sound is 360 m s−1. Therefore, for minimum wavelength, the frequency f = 20 kHz. We know that v = fλ. Find the minimum and maximum wavelengths of sound in water that is in the audible range (20−20000 Hz) for an average human ear. Speed of sound in water = 1450 m s−1. f∝1λ(a) For minimum wavelength, the frequency should be maximum. As v=fλ,∴ λ=vf.⇒ λ=145020×103⇒λ=7.25 cm(b) For maximum wave length, the frequency should be minimum. Sound waves from a loudspeaker spread nearly uniformly in all directions if the wavelength of the sound is much larger than the diameter of the loudspeaker. (a)Calculate the frequency for which the wavelength of sound in air is ten times the diameter of the speaker if the diameter is 20 cm. (b) Sound is essentially transmitted in the forward direction if the wavelength is much shorter than the diameter of the speaker. Calculate the frequency at which the wavelength of the sound is one tenth of the diameter of the speaker described above. The diameter of the loudspeaker is 20 cm. wavelength (λ) of the sound is 10 times the diameter of the loudspeaker. (a) Frequency f = ? ∴ f=vλ=3402=170 Hz(b) Here, wavelength is one tenth of the diameter of the loudspeaker. Ultrasonic waves of frequency 4.5 MHz are used to detect tumour in soft tissue. The speed of sound in tissue is 1.5 km s−1 and that in air is 340 m s−1. Find the wavelength of this ultrasonic wave in air and in tissue. The equation of a travelling sound wave is y = 6.0 sin (600 t − 1.8 x) where y is measured in 10−5 m, t in second and x in metre. (a) Find the ratio of the displacement amplitude of the particles to the wavelength of the wave. (b) Find the ratio of the velocity amplitude of the particles to the wave speed. (a) We have: 2πλ=1.8 ⇒λ=2π1.8So, required ratio: Aλ=6.0×(1.8)×10-5m/s(2π)=1.7×10-5 m(b) Let Vy be the velocity amplitude of the wave. A sound wave frequency 100 Hz is travelling in air. The speed of sound in air is 350 m s−1. (a) By how much is the phase changed at a given point in 2.5 ms? (b) What is the phase difference at a given instant between two points separated by a distance of 10.0 cm along the direction of propagation? Two point sources of sound are kept at a separation of 10 cm. They vibrate in phase to produce waves of wavelength 5.0 cm. What would be the phase difference between the two waves arriving at a point 20 cm from one source (a) on the line joining the sources and (b) on the perpendicular bisector of the line joining the sources? Phase difference is given by: ϕ=2πλ∆xSo,ϕ=2π5×10=4πTherefore, the phase difference is zero. (b) Zero: the particles are in the same phase since they have the same path. Calculate the speed of sound in oxygen from the following data. The mass of 22.4 litre of oxygen at STP (T = 273 K and p = 1.0 × 105 N m−2) is 32 g, the molar heat capacity of oxygen at constant volume is Cv = 2.5 R and that at constant pressure is Cp = 3.5 R.
We know that:CpCv=γ∴ γ=3.5 R2.5 R=1.4Velocity of sound is given by: v=γpρ,where v is the speed of sound.On substituting the respective values in the above formula, we get: v=1.4×1.0×1053222.4⇒v=310 m/sTherefore, the speed of sound in oxygen is 310 m/s. The speed of sound as measured by a student in the laboratory on a winter day is 340 m s−1 when the room temperature is C17°. What speed will be measured by another student repeating the experiment on a day when the room temperature is 32°C? Let the velocity of sound at a temperature T2 be v2. v∝TSo,v1v2=T1T2⇒v2=v1×T2T1On substituting the respective values, we get:v2=340×305290=349 m/sHence, the final velocity of sound is 349 m/s. At what temperature will the speed of sound be double of its value at 0°C? where T1 = 0Ëš C = 273 K.
Let T2 be the temperature at which the speed of sound (v2) will be double its value at 0Ëš C.
The absolute temperature of air in a region linearly increases from T1 to T2 in a space of width d. Find the time taken by a sound wave to go through the region in terms of T1, T2, d and the speed v of sound at 273 K. Evaluate this time for T1 = 280 K, T2 = 310 K, d = 33 m and v = 330 m s−1. The absolute temperature of air in a region increases linearly from T1 to T2 in a space of width d.
The speed of sound at 273 K is v.
vT is the velocity of the sound at temperature T.
Let us find the temperature variation at a distance x in the region. Find the change in the volume of 1.0 litre kerosene when it is subjected to an extra pressure of 2.0 × 105 N m−2 from the following data. Density of kerosene = 800 kg m−3 and speed of sound in kerosene = 1330 ms−1. whereK=v2ρ.⇒K=13302×800 N/m2As we know, K=FA∆VV.∴ ∆V=Pressure×VK ∵P= FAOn substituting the respective values, we get:∆V=2×105×1×10-31330×1330×800=0.14 cm3Therefore, the change in the volume of kerosene âˆ†V = 0.14 cm3. Calculate the bulk modulus of air from the following data about a sound wave of wavelength 35 cm travelling in air. The pressure at a point varies between (1.0 × 105 ± 14) Pa and the particles of the air vibrate in simple harmonic motion of amplitude 5.5 × 10−6 m.
A sources of sound operates at 2.0 kHz, 20 W emitting sound uniformly in all directions. The speed of sound in air is 340 m s−1 and the density of air is 1.2 kg m −3. (a) What is the intensity at a distance of 6.0 m from the source? (b) What will be the pressure amplitude at this point? (c) What will be the displacement amplitude at this point? where A is the area. I=p022ρv.⇒ P0=I×2ρv⇒P0=2×1.2×340×44×10-3⇒P0=6.0 Pa or N/m2(c) As we know, I = 2π2S02v2ρV. S0 is the displacement amplitude. The intensity of sound from a point source is 1.0 × 10−8 W m−2 at a distance of 5.0 m from the source. What will be the intensity at a distance of 25 m from the source? The sound level at a point 5.0 m away from a point source is 40 dB. What will be the level at a point 50 m away from the source? βB be the sound level at a distance of 50 m (= r2) away from the point source. βA=10 log10 IAI0.⇒ IAI0=10βA10 …..1βB=10 log10IBIo⇒ IBI0=10βB10 …..2From 1 and 2, we get: IAIB=10βA-βB10 ….3Also, IAIB=rB2rA2=5052 = 102 …..4From 3 and 4, we get:102=10βA-βB10⇒ βA-βB10=2 ⇒ βA-βB=20⇒ βB=40-20=20 dBThus, the sound level of a point 50 m away from the point source is 20 dB. If the intensity of sound is doubled, by how many decibels does the sound level increase? β1 be the sound level. If the intensity of the sound is doubled, then its sound level becomes 2I. where I0 is the constant reference intensity. β2-β1=10 log2II =10×0.3010=3 dBThe sound level is increased by 3 dB. Sound with intensity larger than 120 dB appears pain full to a person. A small speaker delivers 2.0 W of audio output. How close can the person get to the speaker without hurting his ears? The sound level that can hurt the human ear is 120 dB. Then, the intensity I is 1 W/m2. Let the closest distance be x. ⇒ x2=24π⇒ x=0.4 m=40 cm Hence, the closest distance of the human ear from the small speaker is 40 cm. If the sound level in a room is increased from 50 dB to 60 dB, by what factor is the pressure amplitude increased? The noise level in a classroom in absence of the teacher is 50 dB when 50 students are present. Assuming that on the average each student output same sound energy per second, what will be the noise level if the number of students is increased to 100? where I0 is the constant reference intensity, I is the intensity and β is the sound level. β2will be = 50+3 = 53 dB. In Quincke’s experiment the sound detected is changed from a maximum to a minimum when the sliding tube is moved through a distance of 2.50 cm. Find the frequency of sound if the speed of sound in air is 340 m s−1. Frequency of sound f = ? ∴ f=vλ⇒f=34010-1= 3400 Hz=3.4 kHzTherefore, the frequency of the sound is 3.4 kHz. In Quincke’s experiment, the sound intensity has a minimum value l at a particular position. As the sliding tube is pulled out by a distance of 16.5 mm, the intensity increases to a maximum of 9 l. Take the speed of sound in air to be 330 m s−1. (a) Find the frequency of the sound source. (b) Find the ratio of the amplitudes of the two waves arriving at the detector assuming that it does not change much between the positions of minimum intensity and maximum intensity. The sliding tube is pulled out by a distance of 16.5 mm. A1+A2A1-A2=31⇒A1A2=3+13-1=21So, the ratio of the amplitudes is 2. Two audio speakers are kept some distance apart and are driven by the same amplifier system. A person is sitting at a place 6.0 m from one of the speakers and 6.4 m from the other. If the sound signal is continuously varied from 500 Hz to 5000 Hz, what are the frequencies for which there is a destructive interference at the place of the listener? Speed of sound in air = 320 m s−1. λ=vf=320fFor destructive interference, the path difference of the two sound waves reaching the listener should be an odd integral multiple of half of the wavelength. ∴∆x=(2n+1)λ2 , where n is an integer. 0.4 m=2n+1×3202f⇒f=2n+13202×0.4⇒f=(2n+1) 400 HzThus, on applying the different values of n, we find that the frequencies within the specified range that caused destructive interference are 1200 Hz, 2000 Hz, 2800 Hz, 3600 Hz and 4400 Hz. A source of sound S and detector D are placed at some distance from one another. a big cardboard is placed near hte detector and perpendicular to the line SD as shown in figure. It is gradually moved away and it is found that the intensity changes from a maximum to a minimum as the board is moved through a distance of 20 cm. Find the frequency of the sound emitted. Velocity of sound in air is 336 m s−1. ⇒f=33680×10-2=420 HzTherefore, the frequency of the sound emitted from the source is 420 Hz. 2dfrom the source and the detector as shown in figure. The source emits a wave of wavelength = d/2 which is received by the detector after reflection from the cardboard. It is found to be in phase with the direct wave received from the source. By what minimum distance should the cardboard be shifted away so that the reflected wave becomes out of phase with the direct wave? Two stereo speakers are separated by a distance of 2.40 m. A person stands at a distance of 3.20 m directly in front of one of the speakers as shown in figure. Find the frequencies in the audible range (20-2000 Hz) for which the listener will hear a minimum sound intensity. Speed of sound in air = 320 m s−1. Frequency of the two stereo speakers f = ? =320fWe know that destructive interference will occur if the path difference is an odd integral multiple of the wavelength. (3.2)2+(2.4)2-3.2=(2n+1)2320f⇒16-3.2=2n+12320f⇒0.8×2f=2n+1×320⇒ 1.6f=2n+1×320⇒f= 200(2n+1)On putting the value of n = 1,2,3,…49, the person can hear in the audible region from 20 Hz to 2000 Hz. Two speakers S1 and S2, driven by the same amplifier, are placed at y = 1.0 m and y = −1.0 m. The speakers vibrate in phase at 600 Hz. A man stands at a point on the X-axis at a very large distance from the origin and starts moving parallel to the Y-axis. The speed of sound in air is 330 m s−1. (a) At what angle θ will the intensity of sound drop to a minimum for the first time? (b) At what angle will he hear a maximum of sound intensity for the first time? (c) If he continues to walk along the line, how many more can he hear? multiple of half of the wavelength. The constructive interference of sound (maximum intensity) takes place if the path difference is an integral multiple of the wavelength. ydD=2λ, 3λ, 4λ,…..⇒ yD=θ=32°, 64°, 128°He will hear two more maxima at 32° and 64° because the maximum value of θ may be 90°. Three sources of sound S1, S2 and S3 of equal intensity are placed in a straight line with S1S2 = S2S3. At a point P, far away from the sources, the wave coming from S2 is 120° ahead in phase of that from S1. Also, the wave coming from S3 is 120° ahead of that from S2. What would be the resultant intensity of sound at P? All the three sources of sound, namely, S1, S2 and S3 emit equal intensity of sound waves. Therefore, all three sources have equal amplitudes. Now, by vector method, the resultant of the amplitudes is 0. So, the resultant intensity at P is zero. Two coherent narrow slits emitting sound of wavelength λ in the same phase are placed parallel to each other at a small separation of 2λ. The sound is detected by moving a detector on the screen ∑ at a distance D(>>λ) from the slit S1 as shown in figure. Find the distance x such that the intensity at P is equal to the intensity at O.
S1& S2 are in the same phase. At O, there will be maximum intensity. There will be maximum intensity at P.
3D , the intensity at P is equal to the intensity at O. Figure shown two coherent sources S1 and S2 which emit sound of wavelength λ in phase. The separation between the sources is 3λ. A circular wire of large radius is placed in such way that S1,S2 is at the centre of the wire. Find the angular positions θ on the wire for which constructive interference takes place. Let the sound waves from the two coherent sources S1 and S2 reach the point P.
⇒ θ = 0°, 48.2°, 70.5°and 90° are similar points in other quadrants. Find the fundamental, first overtone and second overtone frequencies of an open organ pipe of length 20 cm. Speed of sound in air is 340 ms−1. A closed organ pipe can vibrate at a minimum frequency of 500 Hz. Find the length of the tube. Speed of sound in air = 340 m s−1. Length of tube L = ? In a standing wave pattern in a vibrating air column, nodes are formed at a distance of 4.0 cm. If the speed of sound in air is 328 m s−1, what is the frequency of the source? Frequency of source f = ? Hence, the required frequency of the source is 4.1 KHz. The separation between a node and the next antinode in a vibrating air column is 25 cm. If the speed of sound in air is 340 m s−1, find the frequency of vibration of the air column. Frequency of vibration of the air column f = ? 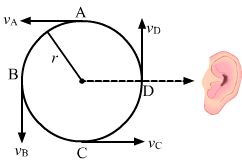 The distance between two nodes or anti-nodes is λ. ⇒ f=vλ=3401=340 HzHence, the frequency of vibration of the air column is 340 Hz. A cylindrical metal tube has a length of 50 cm and is open at both ends. Find the frequencies between 1000 Hz and 2000 Hz at which the air column in the tube can resonate. Speed of sound in air is 340 m s−1. f1=v2L=3402×50×10-2=340 HertzSo, the required harmonics will be in the range of 1000 Hz to 2000 Hz. f2=2×340=680 Hzf3=3×340=1020 Hzf4=4×340=1360 Hzf5=5×340=1700 Hzf6=6×340=2040 Hz f2, f3, f4… are the second, third, fourth overtone, and so on. The possible frequencies between 1000 Hz and 2000 Hz are 1020 Hz, 1360 Hz and 1700 Hz. In a resonance column experiment, a tuning fork of frequency 400 Hz is used. The first resonance is observed when the air column has a length of 20.0 cm and the second resonance is observed when the air column has a length of 62.0 cm. (a) Find the speed of sound in air. (b) How much distance above the open end does the pressure node form? where v is the speed of the sound in air. v=0.84×400=336 m/sTherefore, the speed of the sound in air is 336 m/s. 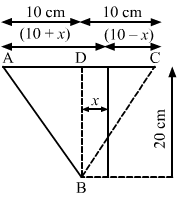 L1+d=λ4⇒d=λ4-L1=21-20=1 cmTherefore, the required distance is 1 cm. The first overtone frequency of a closed organ pipe P1 is equal to the fundamental frequency of a open organ pipe P2. If the length of the pipe P1 is 30 cm, what will be the length of P2? Length of open organ pipe L2 = ? f2 be the frequencies of the closed and open organ pipes, respectively. where v is the speed of sound in air. f1=f2 3×v4×30=v2L2 ⇒ L2=20 cm∴ The length of the pipe P2 will be 20 cm. A copper rod of length 1.0 m is clamped at its middle point. Find the frequencies between 20 Hz and 20,000 Hz at which standing longitudinal waves can be set up in the rod. The speed of sound in copper is 3.8 km s−1. Let f be the frequency of the longitudinal waves. where n = 0, 1, 2, 3, …10. Find the greatest length of an organ pipe open at both ends that will have its fundamental frequency in the normal hearing range (20 − 20,000 Hz). Speed of sound in air = 340 m s−1. since, for maximum wavelength, the frequency is a minimum. Length of organ pipe l = ? I=3402×20⇒ l=344=8.5 mLength of the organ pipe is 8.5 m.
An open organ pipe has a length of 5 cm. (a) Find the fundamental frequency of vibration of this pipe. (b) What is the highest harmonic of such a tube that is in the audible range? Speed of sound in air is 340 m s−1 and the audible range is 20-20,000 Hz. The audible range is from 20 Hz to 20,000 Hz. An electronically driven loudspeaker is placed near the open end of a resonance column apparatus. The length of air column in the tube is 80 cm. The frequency of the loudspeaker can be varied between 20 Hz and 2 kHz. Find the frequencies at which the column will resonate. Speed of sound in air = 320 m s−1. The frequency of the loudspeaker can be varied between 20 Hz to 2 KHz. The resonance column apparatus is equivalent to a closed organ pipe. ⇒ f=3204×50×10-2=100 HzSo, the frequency of the other harmonics will be odd multiples of f = (2n + 1)100 Hz. According to the question, the harmonic should be between 20 Hz and 2 kHz. A piston is fitted in a cylindrical tube of small cross section with the other end of the tube open. The tube resonates with a tuning fork of frequency 512 Hz. The piston is gradually pulled out of the tube and it is found that a second resonance occurs when the piston is pulled out through a distance of 32.0 cm. Calculate the speed of sound in the air of the tube. Let the speed of sound in the tube be v.
Let l1 be the length at which the piston resonates for the first time and l2 be the length at which the piston resonates for the second time. Hence, the speed of the sound in the tube is 328 m/s. A U-tube having unequal arm-lengths has water in it. A tuning fork of frequency 440 Hz can set up the air in the shorter arm in its fundamental mode of vibration and the same tuning fork can set up the air in the longer arm in its first overtone vibration. Find the length of the air columns. Neglect any end effect and assume that the speed of sound in air = 330 m s−1. Let the length of the shorter arm of the tube be L1 . Let the length of the longer arm of the tube be L2 . Consider the situation shown in figure.The wire which has a mass of 4.00 g oscillates in its second harmonic and sets the air column in the tube into vibrations in its fundamental mode. Assuming that the speed of sound in air is 340 m s−1, find the tension in the wire. 85=22×0.4T10-2⇒T=(85)2×(0.4)2×10-2 =11.6 NewtonHence, the tension in the wire is 11.6 N.
A 30.0-cm-long wire having a mass of 10.0 g is fixed at the two ends and is vibrated in its fundamental mode. A 50.0-cm-long closed organ pipe, placed with its open end near the wire, is set up into resonance in its fundamental mode by the vibrating wire. Find the tension in the wire. Speed of sound in air = 340 m s−1. m=MassUnit length=33×10-3kg/mLet the tension in the string be T.
170=12×30×10-2×T33×10-3⇒ T=347 NewtonHence, the tension in the wire is 347 N.
Let f be the frequency of an open pipe at a temperature T. When the fundamental frequency of an organ pipe changes from v to v + âˆ†v, the temperature changes from T to T + âˆ†T. The fundamental frequency of a closed pipe is 293 Hz when the air in it is a temperature of 20°C. What will be its fundamental frequency when the temperature changes to 22°C? The fundamental frequency of a closed pipe is 293 Hz. Let this be represented by f1. Let f2 be the frequency in the closed pipe when the temperature of the air is T2 . A Kundt’s tube apparatus has a copper rod of length 1.0 m clamped at 25 cm from one of the ends. The tube contains air in which the speed of sound is 340 m s−1. The powder collects in heaps separated by a distance of 5.0 cm. Find the speed of sound waves in copper. A source of sound with adjustable frequency produces 2 beats per second with a tuning fork when its frequency is either 476 Hz of 480 Hz. What is the frequency of the tuning fork? As the tuning fork produces 2 beats, its frequency should be an average of two. A tuning fork produces 4 beats per second with another tuning fork of frequency 256 Hz. The first one is now loaded with a little wax and the beat frequency is found to increase to 6 per second. What was the original frequency of the tuning fork? Now, as it is loaded with wax, its frequency will decrease. As it produces 6 beats per second, the original frequency must be 252 Hz. 260 Hz is not possible because on decreasing the frequency, the beats per second should decrease, which is not possible. Calculate the frequency of beats produced in air when two sources of sound are activated, one emitting a wavelength of 32 cm and the other of 32.2 cm. The speed of sound in air is 350 m s−1. A tuning fork of unknown frequency makes 5 beats per second with another tuning fork which can cause a closed organ pipe of length 40 cm to vibrate in its fundamental mode. The beat frequency decreases when the first tuning fork is slightly loaded with wax. Find its original frequency. The speed of sound in air is 320 m s−1. n=v4L=3204×40×10-2=200 HzAs the tuning fork produces 5 beats with the closed pipe, its frequency must be 195 Hz or 205 Hz. The frequency of the tuning fork decreases as and when it is loaded. Therefore, the frequency of the tuning fork should be 205 Hz. A piano wire A vibrates at a fundamental frequency of 600 Hz. A second identical wire B produces 6 beats per second with it when the tension in A is slightly increased. Find the the ratio of the tension in A to the tension in B.
n=12ITmIt is clear from the above relation that as the tension increases, the frequency increases. nB=12ITBmIt is given that 6 beats are produced when the tension in A is increased. A tuning fork of frequency 256 Hz produces 4 beats per second with a wire of length 25 cm vibrating in its fundamental mode. The beat frequency decreases when the length is slightly shortened. What could be the minimum length by which the wire we shortened so that it produces no beats with the tuning fork? Let T be the tension and m the mass per unit length of the wire. f=12lTmIt is clear from the above relation that by shortening the length of the wire, the frequency of the vibrations increases. 256=12×25×10-2Tm …(1)Let the length of the wire be l1, after it is slightly shortened. As the vibrating wire produces 4 beats with 256 Hz, its frequency must be 252 Hz or 260 Hz. Again, its frequency must be 252 Hz, as the beat frequency decreases on shortening the wire. A traffic policeman standing on a road sounds a whistle emitting the main frequency of 2.00 kHz. What could be the apparent frequency heard by a scooter-driver approaching the policeman at a speed of 36.0 km h−1? Speed of sound in air = 340 m s−1. The horn of a car emits sound with a dominant frequency of 2400 Hz. What will be the apparent dominant frequency heard by a person standing on the road in front of the car if the car is approaching at 18.0 km h−1? Speed of sound in air = 340 m s−1. A person riding a car moving at 72 km h−1 sound a whistle emitting a wave of frequency 1250 Hz. What frequency will be heard by another person standing on the road (a) in front of the car (b) behind the car? Speed of sound in air = 340 m s−1. A train approaching a platform at a speed of 54 km h−1 sounds a whistle. An observer on the platform finds its frequency to be 1620 Hz. the train passes the platform keeping the whistle on and without slowing down. What frequency will the observer hear after the train has crossed the platform? The speed of sound in air = 332 m s−1. f0 be the original frequency of the train. A bullet passes past a person at a speed of 220 m s−1. Find the fractional change in the frequency of the whistling sound heard by the person as the bullet crosses the person. Speed of sound in air = 330 m s−1. Let the frequency of the bullet be f.
A violin player riding on a slow train plays a 440 Hz note. Another violin player standing near the track plays the same note. When the two are closed by and the train approaches the person on the ground, he hears 4.0 beats per second. The speed of sound in air = 340 m s−1. (a) Calculate the speed of the train. (b) What beat frequency is heard by the player in the train? Let the velocity of the train (sources) be vs.
⇒340×444-440=440×vs⇒340×4=440×vs⇒vs =3.09 m/s=11 km/h(b) The sitting man will listen to fewer than 4 beats/s. Two identical tuning forks vibrating at the same frequency 256 Hz are kept fixed at some distance apart. A listener runs between the forks at a speed of 3.0m s−1 so that he approaches one tuning fork and recedes from the other figure. Find the beat frequency observed by the listener. Speed of sound in air = 332 m s−1. Figure shows a person standing somewhere in between two identical tuning forks. each vibrating at 512 Hz. If both the tuning forks move towards right a speed of 5.5 m s−1, find the number of beats heard by the listener. Speed of sound in air = 330 m s−1. As the difference is greater than 10 ( persistence of sound for the human ear is 1/10 of a second), the sound gets overlapped and the observer is not able to distinguish between the sounds and the beats. A small source of sound vibrating at frequency 500 Hz is rotated in a circle of radius 100/π cm at a constant angular speed of 5.0 revolutions per second. A listener situation situates himself in the plane of the circle. Find the minimum and the maximum frequency of the sound observed. Speed of sound in air = 332 m s−1. Let X be the position where the observer will listen at a maximum and Y be the position where he will listen at the minimum frequency. Two trains are travelling towards each other both at a speed of 90 km h−1. If one of the trains sounds a whistle at 500 Hz, what will be the apparent frequency heard in the other train? Speed of sound in air = 350 m s−1. f=350+25350-25×500=577 HzThe apparent frequency heard in the other train is 577 Hz. A car moving at 108 km h−1 finds another car in front it going in the same direction at 72 km h−1. The first car sounds a horn that has a dominant frequency of 800 Hz. What will be the apparent frequency heard by the driver in the front car? Speed of sound in air = 330 m s−1. Two submarines are approaching each other in a calm sea. The first submarine travels at a speed of 36 km h−1 and the other at 54 km h−1 relative to the water. The first submarine sends a sound signal (sound waves in water are also called sonar) at a frequency of 2000 Hz. (a) At what frequency is this signal received from the second submarine. At what frequency is this signal received by the first submarine. Take the speed of of the sound wave in water to be 1500 m s−1. A small source of sound oscillates in simple harmonic motion with an amplitude of 17 cm. A detector is placed along the line of motion of the source. The source emits a sound of frequency 800 Hz which travels at a speed of 340 m s−1. If the width of the frequency band detected by the detector is 8 Hz, find the time period of the source. f1correspond to the maximum and minimum apparent frequencies (Both will be at the mean position because the velocity is maximum). A boy riding on his bike is going towards east at a speed of 4√2 m s−1. At a certain point he produces a sound pulse of frequency 1650 Hz that travels in air at a speed of 334 m s−1. A second boy stands on the ground 45° south of east from his. Find the frequency of the pulse as received by the second boy. A sound source, fixed at the origin, is continuously emitting sound at a frequency of 660 Hz. The sound travels in air at a speed of 330 m s−1. A listener is moving along the lien x = 336 m at a constant speed of 26 m s−1. Find the frequency of the sound as observed by the listener when he is (a) at y = − 140 m, (b) at y = 0 and (c) at y = 140 m.
Frequency of sound heard by observer n = ? n=v+v0cosθv n0=330+26×140364330×660=340×2=680 Hz(b) When the observer is at y = 0, the velocity of the observer with respect to the source is zero. Therefore, he will hear at a frequency of 660 Hz. A train running at 108 km h−1 towards east whistles at a dominant frequency of 500 Hz. Speed of sound in air is 340 m/s. What frequency will a passenger sitting near the open window hear? (b) What frequency will a person standing near the track hear whom the train has just passed? (c) A wind starts blowing towards east at a speed of 36 km h−1. Calculate the frequencies heard by the passenger in the train and by the person standing near the track. (a) Since the velocity of the passenger with respect to the train is zero, he will hear at a frequency of 500 Hz. 36×518 = 10 ms-1 The frequency heard by the passenger is unaffected (= 500 Hz). A boy riding on a bicycle going at 12 km h−1 towards a vertical wall whistles at his dog on the ground. If the frequency of the whistle is 1600 Hz and the speed of sound in air is 330 m s−1, find (a) the frequency of the whistle as received by the wall (b) the frequency of the reflected whistle as received by the boy. Frequency of whistle received by wall n = ? A person standing on a road sends a sound signal to the driver of a car going away from him at a speed of 72 km h−1. The signal travelling at 330 m s−1 in air and having a frequency of 1600 Hz gets reflected from the body of the car and returns. Find the frequency of the reflected signal as heard by the person. n = 330-20330+20×1600=1417 HzThe frequency of the reflected signal as heard by the person is 1417 Hz. A car moves with a speed of 54 km h−1 towards a cliff. The horn of the car emits sound of frequency 400 Hz at a speed of 335 m s−1. (a) Find the wavelength of the sound emitted by the horn in front of the car. (b) Find the wavelength of the wave reflected from the cliff. (c) What frequency does a person sitting in the car hear for the reflected sound wave? (d) How many beats does he hear in 10 seconds between the sound coming directly from the horn and that coming after the reflection? f2=v+v0v×f1⇒f2=335+15335×335320×400⇒f2=437 Hz(d) He will not hear any beat in 10 seconds because the difference of frequencies is greater than 10 (persistence of sound for the human ear is 1/10 of a second). Let the speed of the car be x m/s. 410=324324-x×324+x324×400⇒ 410=324+x324-x×400⇒ 410 324-x=400324+x⇒ 324 410-400=810x⇒ x=4 m/s The speed of the car is 4 m/s. Figure shows a source of sound moving along X-axis at a speed of 22 m s−1 continuously emitting a sound of frequency 2.0 kHz which travels in air at a speed of 330 m s−1. A listener Q stands on the Y-axis at a distance of 330 m from the origin. At t = 0, the sources crosses the origin P. (a) When does the sound emitted from the source at P reach the listener Q? (b) What will be the frequency heard by the listener at this instant? (c) Where will the source be at this instant? 330330 = 1 s(b) The frequency of sound heard by the listener is 2 kHz. ×1 s) away from P on x-axis. A source emitting sound at frequency 4000 Hz, is moving along the Y-axis with a speed of 22 m s−1. A listener is situated on the ground at the position (660 m, 0). Find the frequency of the sound received by the listener at the instant the source crosses the origin. Speed of sound in air = 330 m s−1. to reach the listener is the same as the time taken by the sound to reach the origin. A source of sound emitting a 1200 Hz note travels along a straight line at a speed of 170 m s−1. A detector is placed at a distance 200 m from the line of motion of the source. (a) Find the frequency of sound receive by the detector at the instant when the source gets closest to it. (b) Find the distance between the source and the detector at the instant in detects the frequency 1200 Hz. Velocity of sound in air = 340 m s−1. the time taken by the sound to reach the listener is the same as the time taken by the sound to reach the point of intersection. f=vv-vs cos v×f0⇒f=340340-170×12×1200⇒f=1600 Hz(b) The detector will detect a frequency of 1200 Hz at a minimum distance. A source emitting a sound of frequency v is placed at a large distance from an observer. The source starts moving towards the observer with a uniform acceleration a. Find the frequency heard by the observer corresponding to the wave emitted just after the source starts. The speed of sound in the medium is v.
Let d be the initial distance between the source and the observer.